If you want to keep your beard clean, you’ll need to learn to wash it with the best beard soaps. Your beard care routine should always include a good beard shampoo or soap. The fact is that your facial hair does get dirty with pollutants, grease, and bacteria, and if you don’t want to experience beard itch, dandruff, acne, or skin irritation, you absolutely need to use a top-rated beard soap. But you don’t need to spend a lot of money to get a quality soap bar with all-natural ingredients. On the contrary, the best beard soap bars are cheap, come with organic ingredients and oils, work great with sensitive skin, prevent dandruff, and deliver you a smooth, soft beard. In fact, washing your beard with the right type of soap can actually help it grow longer and thicker. As you might have expected, the top beard products came from the most reputable brands. Honest Amish’s Beard Soap and Professor Fuzzworthy’s Beard Shampoo had the highest-quality products and followed through with great results. Both will exfoliate, moisturize, condition, and soften your beard and skin. However, Maple Hill’s Mint Tea Tree Oil Beard Wash also performed very well, making it an excellent option for the right guys. Now let’s dive into our reviews of the best beard soaps of the year! Honest Amish is easily one of the top beard care brands in the industry. With a reputation for high-quality grooming and styling products, Honest Amish Beard Soap deserves to be at the top of our list. For starters, this bar of soap is made of all-natural, organic ingredients, including virgin olive, avocado, palm, coconut, apricot kernel, and castor oil. Along with french yellow clay and other botanicals for extra cleansing power, the addition of eucalyptus, cinnamon, and clove essential oils nourish and deep condition for a healthy, clean beard. Beyond a nice cleanse, this recipe works to reduce beardruff, remove dead skin cells, get rid of acne, and soften your facial hair, all while being gentle on sensitive skin. It also helps that the bar lathers well, allowing you to reach every part of your face with very little effort. Fortunately, even with a great lather, one soap bar lasts quite a while. Hand-crafted in the USA, this mild formula won’t dry out your beard or face. Ultimately, this beard soap is all about gentle cleansing and extreme moisturizing, which will get rid of dandruff and prevent itchiness. Backed by a 100% satisfaction guarantee, Honest Amish’s Beard and Body Soap is worth the investment! For men who need a strong exfoliating beard wash, try the extra grit version! 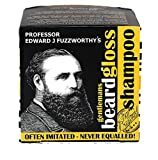 Professor Fuzzworthy’s Beard Shampoo is widely considered the other top-rated beard soap on the market. Made with premium natural ingredients and essential oils, regularly washing your beard with this product will promote growth while giving you the smooth, shiny facial hair you’ve been searching for. This particular beard shampoo comes in bar form instead of liquid. Sized perfectly to fit in the palm of your hand, the recipe adds no parabens, fragrances, artificial colorings, or harsh synthetic chemicals. Instead, guys get a natural shampoo bar made of olive oil, castor oil, Leatherwood beeswax, honey, Tasmanian seaweed extract, cocoa powder, and essential oils such as kunzea and lavender. These ingredients work together to strengthen your hair follicles and help beard growth, while keeping your face and beard clean, healthy, and conditioned. Because of this soaps ability to intensely hydrate and moisturize facial hair and skin, most guys find it preserves your body’s natural oils, relieves beard itch, gets rid of flakes, and generally prevents dandruff. All of these benefits combine to make your beard more manageable and easier to style. Although you’ll love how soft your beard feels after using this shampoo, we still highly recommend you apply a good beard oil and balm afterwards. One factor guys should be aware of is that, because this soap doesn’t utilize any of the synthetic ingredients that keep a regular bar of soap together and hard, it can dissolve quicker when left moist. For this reason, we suggest men use it in the shower but store it outside, in a dry area, to increase its lifespan. If you want a soap that smells good with a light, lavender scent, yet is a powerful cleanser and moisturizer, Professor Fuzzworthy’s Beard Shampoo is the right choice for you. Handmade in the US with quality carrier oils, essential oils, and butter, Maple Hill’s Honest For Men Beard Wash doesn’t need complicated ingredients or branding to create a soap that stands out. Maple Hill is a company that focuses on 100% natural ingredients to maximize beard health, and their special formula with mint tea tree oil offers a winning product that will cleanse, condition and soften your facial hair and skin. Like the other products on our list, Maple Hill utilizes the moisturizing power of essential oils to keep your beard free of frizz and easy to tame, no matter how unruly your facial hair may be. The key ingredients are coconut oil, palm oil, castor oil, olive oil, hemp seed butter, shea butter, avocado oil, jojoba oil, tea tree oil, and a number of other nourishing oils that will hydrate and stimulate growth. The butters are an especially nice touch that add a soft, creamy texture to the lather. This beard soap also promotes a healthy shine to keep your facial hair looking sleek and free of dandruff. The end result is the perfect beard free of itchiness, flakes or irritation. Plus, the mint tea tree scent is sweet and light, leaving your face smelling undoubtedly desirable. If you don’t want to worry about unnecessary dryness or irritation, the Honest for Men Beard Wash is perfect for you. With incredibly high customer satisfaction ratings and reviews, you’re sure to get a beard soap that will work wonders on any hair or skin type.